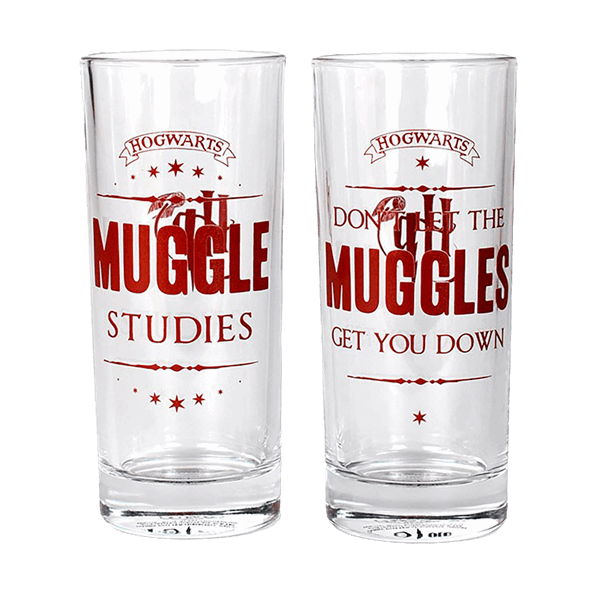 Bring some of the magic of the Harry Potter world into your life with these elegant glasses. These sleek glasses are perfect for any Harry Potter fan who wants to add to their magical collection. These sturdy glass tumblers are a mystical and practical addition to any home. We all remember the iconic stories, and you can celebrate them with these great glass tumblers. 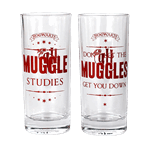 Simple yet striking, these glasses have been stamped with a brilliant burgundy font, and the words “Don’t Let The Muggles Get You Down” are stamped on one glass, and “Muggle Studies” is stamped on the other glass. The glasses come in a stylish Harry Potter themed box, making them a great gift option for any fan. These are officially licensed Warner Bros merchandise, and they are sure to be a proud addition to any Harry Potter collection!